LONDON (Reuters) - Bad luck seems to follow Kei Nishikori around at Wimbledon. For the second consecutive year injury, and not an opponent, knocked the Japanese fifth seed out of the world's most famous tennis tournament. Last year the 2014 U.S. Open runner-up had to bow out of the grasscourt championships before his second-round match against Santiago Giraldo because of a calf strain he picked up in the Halle warm-up tournament. 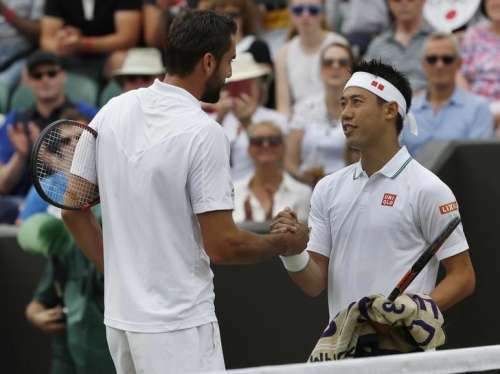 It was a case of "oh no, not again" for Nishikori on Monday as, facing Croatia's Marin Cilic for a place in the quarter-finals, he was felled by a rib injury which had also forced him out of Halle. "It's the same injury I had in Halle. It's been not recovering well these two weeks," said Nishikori, who quit before his second-round match at the German event. "After the third round here, it's got worse. I was in too much pain on the court. I couldn't really compete today." His exit will be a huge blow back in his homeland, where his every move is scrutinised by the country's 120 million plus population ever since he became the first Asian man to contest a grand slam singles final at the U.S. Open two years ago. Nishikori's involvement in Monday's match was kept to a minimum during the opening exchanges with Cilic -- the man who beat him to the Flushing Meadows title. With four successive Cilic serves whistling past his ears in the first game, all Nishikori had to do was trudge from one side of the baseline to the other between points. But it soon became apparent that rather than this being super-human performance by the Croatian ninth seed, all was not well in the Nishikori camp. He was 5-0 down within 11 minutes and by the time the set was over five minutes later, Cilic had unleashed 12 aces and dropped only two points on serve. To sum up how bad things were for Nishikori, the first-set statistics said it all. Cilic had won 26 out of 33 points contested. When the 26-year-old's fortunes failed to improve in the second set, with a double fault costing him his serves in the first and fifth games, his coach Michael Chang urged him to call it quits. Such was the nature of the injury, Nishikori was hurting when he served. He was hurting when he attempted overheads -- with one effort drawing a collective gasp as he dumped the ball into the net. And he was hurting as he kept on losing points. Trailing 4-1 in the second set, a concerned Chang stood up in the players' box and gestured with his hands to 'cut it' but Nishikori was not ready to give up on his Wimbledon dreams. He called for the trainer but the medics who arrived on court could not heed his request to strap up his body, and instead he had to make do with swallowing a pill. Unfortunately it wasn't the magic pill he so desperately wanted. One game later, trailing 6-1 5-1, he finally listened to Chang, who could be heard saying "Don't push it, it's not worth it." "Even before the match, I knew it's not going to be easy for me to play hundred percent," said Nishikori, who hopes to have fully recovered before returning to action in Toronto on July 25. "Every point I played, the pain got worse. I didn't want to, but I had to retire today."